We’ve been getting requests for band T-Shirts lately (thank you for caring enough to ask BTW) so I figured I’d get the ball rolling by whipping up a few designs. Stop by the store and look them over. If you do not see anything you like, and/or have a better idea for a shirt, let me know in the comments below. Your ideas are welcome. Also, I heard that other artists have been putting lyrics from their songs on T-shirts. I was thinking that could be pretty cool. Let me know what line (or lines) you think would be good on a T-shirt in the comments below. 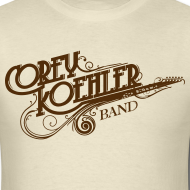 Click here to check out the T-Shirt Store now.